Do you need copper repiping in your Nuevo house or business? - Do you have a dramatic drop in water pressure? - Does your tap water appear discolored due to rust? - Do you have a foul odor coming from the tap? - Are your pipes leaking? Option One Plumbers can test to determine if your plumbing problems are being caused by eroding pipes and make recommendations on whether it is time for copper repiping or not. If you experience low water pressure, your water is discolored or has a metallic taste, you find water leaking from your concrete slab or foundation, or you discover existing pipes leaking or corroding... it’s time for you to replace your old water pipes with new copper pipes. These combined clues and symptoms are often the early indicators of serious internal pipe corrosion. This could also lead to both apparent and hidden leaks in your house, which can cause expensive repairs and can often be attributed to unhealthy mold and mildew within the walls. As galvanized pipes age, the rust and corrosion build up, eventually causing the inside diameter of the pipe to close off, restricting the flow of water. At the same time, the reduced volume of water in the system is not sufficient to supply multiple fixtures at one time. The rust within the pipes is also transferred to the water that you are bathing in or drinking. Eventually, the rust will eat completely through the iron pipe and you will experience leaks or total pipe failure. Option One Plumbing specializes in repiping with Copper or Polybutylene water lines. We also repair slab leaks, copper pipe leak repairs, poly pipe leak repairs, and any other plumbing problem you may have. Why Copper Re-Pipe Your Home In Nuevo? The most trusted means of providing water within a building or a house is by way of copper repiping. Replacing old galvanized pipes has tremendous cost and health benefits. Replacing your old water lines can also save you from countless problems down the road. Even "pinhole" leaks and inferior plumbing will be a thing of the past. Your repipe may eliminate any future costly plumbing headaches for years to come. A copper repipe also adds to the resale value of your home, a huge advantage when putting your house on the market since everyone is concerned about water quality when buying a home. A copper repipe on your home is a valuable selling point to a potential home buyer. What Is Copper Re-piping In Nuevo? 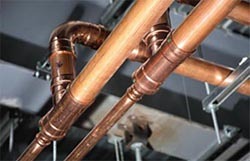 Copper repiping service is a process of refitting or bypassing the existing plumbing or pipes in a home or a business. Many older structures were built with galvanized pipes as a standard building practice. As the galvanized pipes age, the zinc lining they have erodes, allowing rust to form and leading to ‘rusty’ or ‘brown’ colored water as well as low water pressure coming from the faucets. Once galvanized pipes begin to deteriorate, they need to be replaced. 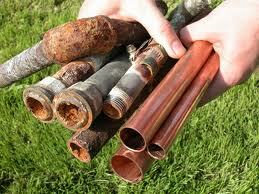 The most preferable method of repair is to replace galvanized pipes with copper pipes, or "copper repiping". New copper pipes are guaranteed to operate efficiently to deliver clean, healthy for the life of your home. How Do We Re-Pipe Or Replace Existing Plumbing In Nuevo? Our copper repiping specialists in Nuevo will come over, lay down protective covering over the floors of your house where we would need to work, and begin the process of opening small areas in walls where pipes protrude, such as behind water closets (toilets), under your sink cabinets, at the water heater, washing machine, behind the refrigerator, at hose bibb locations, etc. We can also run new copper pipe in your attic or crawl space to help reduce the amount of openings that would need to be made in your walls. wall openings are kept to a minimum, and our work is done cleanly with as little intrusion into your home as possible. Our professional team will patch all openings to a "paint ready" condition. You can trust Option One plumbing in Nuevo to get your re-pipe job quickly, efficiently and as cleanly as possible. 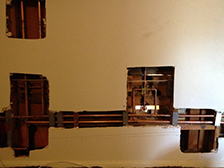 We have decades of experience doing copper re-pipes in Nuevo. Your satisfaction is guaranteed! What Happens After The Repipe? 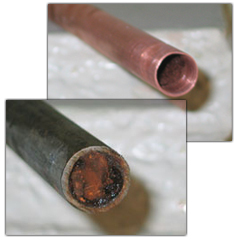 The first thing people notice after a copper repipe is a dramatic increase in water pressure. Over time, corrosion and rust had collected inside your old pipes, restricting flow and causing water pressure loss. You’ll notice an overall improvement in your water quality too. With new copper pipes that are free of contaminants or corrosion, you’ll see a clear difference in the water quality of your shower, your dishwasher and your washing machine. Are There Other Materials That Can Be Used Instead Of Copper? YES! 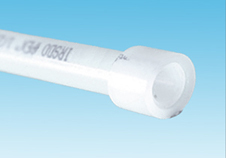 Depending on your home configuration, a PEX repipe may also be an option worth considering. PEX is a great alternative to using copper and has many aesthetic values as well, such as water noise reduction and ease of installation. For more information, give us a call and we can determine what the right solution is for you. We never "oversell". It's is our goal to provide you with the most affordable option that meets your plumbing needs and budget.